DE voting is centralized, just a bunch of people who most probably belong to the same organization, deciding on the future of the apps! Who are they? What is their experience? Nobody wants to tell anyone! This is false. Democracy Earth is an operator that is assisting in getting token holders to vote. We perform explicit audit on these votes and every single vote is tied to a verified token holder. To me this seems like a communication issue, it should be clear to everyone how token holders vote (via Democracy Earth), so we should improve on comms there. I could go and work on a better project that actually pays while I am still writing it here to make you aware of the problems, just because I liked the project. We really appreciate the feedback and the time you’re spending helping us improve! I think that’d be a very drastic step and I don’t think we’ve hit any fundamental issue that calls for such drastic measures at this time. Again, appreciate the feedback. This is the issue that has been raised many times that storage integration should also be required. We all agree on this. Question is how quickly can we enable this. We’re on it. We’re all ears. Keep the feedback coming! YourNote is a project that uses the core features of Blockstack and Gaia and many people use it too (unlike many other projects). Provided that, it’s very disheartening to see such a negative response from App Mining. We feel your pain. This issue has been reported by many developers. Full-fledge apps should get more points than basic functionality. We all agree on this. As mentioned in other comments as well, the only thing to discuss is timing and how soon can this be integrated into App Mining. Please do let us know if you have any other recommendations other than storage vs. only-auth stuff. Thanks! We are compiling a spread sheet with suggestions/improvements. When I joined this community in November of 2017 I was amazed at all the open collaboration and genuinely awesome people. I was a mere freshmen among seasoned ninjas. But I fear for the future of this developer fellowship and new joiners if we don’t make some tweaks to App Rewards Mining. @prabhaav ,@alexc.id and @jehunter5811 taught me how to write collaborative apps using this new architecture. I was brand new to community and they took me under their wing. They always answered my DM’s and walked me thru how they architected their apps. I remember the first time I chatted with Prabhaav on Stealthy and suggested an AOL instant messenger throwback theme . @bodymindarts Taught me multi-sig when I read all of his Github PR’s and forum posts. It was his advanced uses of Blockstack that really led me to try to develop an app that was different and utilized the blockchain. It was during this period I felt part of a community building something truly world changing. It was during this period I was introduced to @aaron and @jude , some of the smartest and giving engineers I have ever met. They taught me so much and really helped me engineer the core “Verification engine” in Blocksuign. It was that “kindness” that made me want to “pay it forward” and help new joiners in Blockstack learn these techniques. 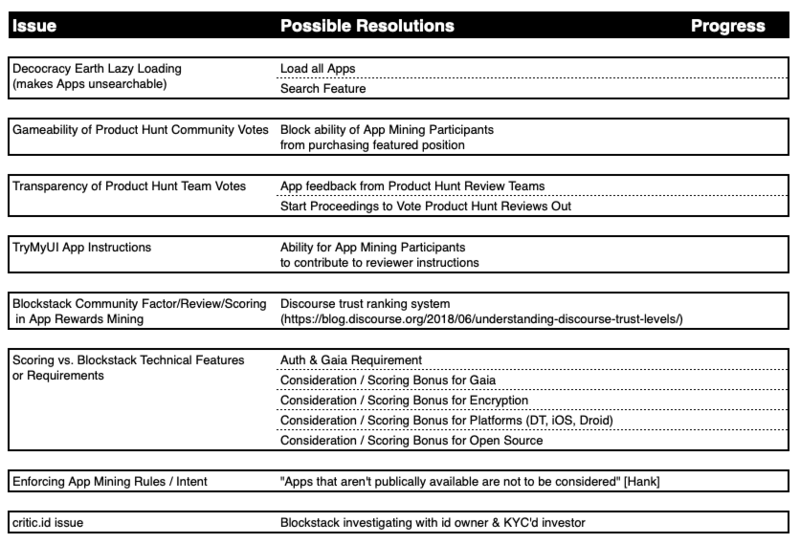 Circa Late 2018 - 2019 - "App Rewards Mining"
App rewards mining is what keeps me going. It’s that small incentive that keeps me building features. After the December pilot I was really put off by my results and “math error” after spending 40+ hours per week for 6 months (on top of my day job) to build. I realized none of the effort I put into building up this community was going to effect my rank. So I selfishly took time off from helping people on the Slack Channel. I thought to myself “why should I help the competitor”? After a well needed Christmas vacation i came back with a renewed sense of what this was all about. For me, it was never for the money. It’s for the vision of decentralization for future generations, for my future kids, for our future society. It’s a much larger scope than my small app. So I re-joined the Slack community full steam ahead and helped troubleshoot login issues with @markmhendrickson and @jehunter5811 and a handful of other Blockstackers! Everyone on this thread has contributed great comments. but i fear if we continue forward we are going to break up this community. I value the community and decentralized future above all else. We cannot lose our early Blockstack ninjas! Thanks so much for sharing your story and for the feedback! We’re open to incorporating ideas around Blockstack community. Also, what I mentioned on the call, we’ve been working extremely hard at a legal framework that can allow the core community to hold tokens and participate (like the existing token holders can). It’s a difference of going from 800+ Accredited Investors to 9000+ community members and can iron out a lot of issues. Today’s meeting was an interesting start towards improving the App Rewards Mining system. Unfortunately there was little clarity, commitment, or action items related to how things would be improved in the short or long term. Stealthy will participate in the next two App Rewards Mining cycles while looking for signs of improvement in the scoring. We specifically are watching for progress on the resolutions identified below and will update the forum after each rewards cycle. @muneeb, @patrick and @hank, let us know if we can help with more specifics or information related to improving App Mining Rewards and thanks for today’s discussion. @alexc.id Thanks for the action item list! I agree 100% on every line item. We agree that App Mining should be for apps that dive headlong into both the Blockstack community/mission and technology. As you can imagine, Blockstack Authentication is much easier to add than integrating Gaia. Thus, we added Authentication to SpringRole quickly (giving it prominence on our login and signup pages). It took longer to add Gaia which is a core part of our Notes functionality. Additionally, Gaia has technical limitations that we are discussing with Blockstack to see how we can use Gaia for other features on SpringRole. If it’s possible, we will use Gaia for those as well. While App Mining rewards are nice to receive, SpringRole is involved with Blockstack for the long run and we are doing what we can to grow the community. We hope the App Mining calculation will add metric to reflect these types of growth in users and usage. Justin, I would love to know your thoughts on this, a couple months later? I don’t mean to single you out, and I mean no malice by it, it’s just fact of the situation; in fact your ascent is admirable; you are the de facto dev standard of Blockstack and can be a huge voice for the developers who may not have one. I believe you may not have that problem anymore haha (I know nothing’s guaranteed and I don’t mean to assume). But as far as being in someone else’s shoes, do you feel as if Blockstack has broken out of game-ability? And do you still feel comfortable participating? Do you think the program is more or less fair since this post? You and others have reiterated the same issues with App Mining that I just recently posted, since its inception, but the flaws still exist, and the chasm is widening as time slips on. I think my silence on the topic since my last post may be misconstrued as not caring. The fact is, it was becoming unhealthy for me to be so passionate about this so frequently. And I think, as you mentioned, it was clear that I was advocating for everyone else. I do think Blockstack has made progress in the gameability area. I do not think they’ve made progress in transparency. Much of your posts and my previous ones are the product of a lack of transparency.